Hot, humid summer afternoons can drag us down. But we perk right up when we sip an Americano—a compelling mix of astringent Campari and sweet vermouth, lightened with sparkling water. The Americano makes a perfect hot-weather apéritif. And it’s fairly low in alcohol, so you can have two without worrying about the consequences. Good thing. Because once you have one, you’re sure to want another. Originally, this cocktail was called the Milano-Torino, after the Italian towns of Milan and Turin. That’s because, as Wikipedia notes, its ingredients included Campari liqueur (which is made in Milan) and Punt e Mes (a sweetish vermouth from Turin). 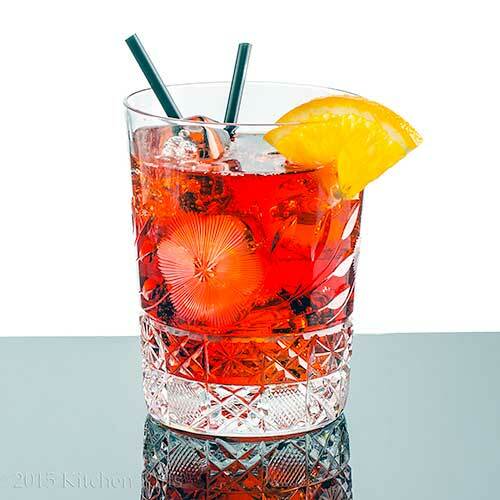 The Americano somewhat resembles the Negroni Cocktail—which is equal parts Campari, sweet vermouth, and dry gin. 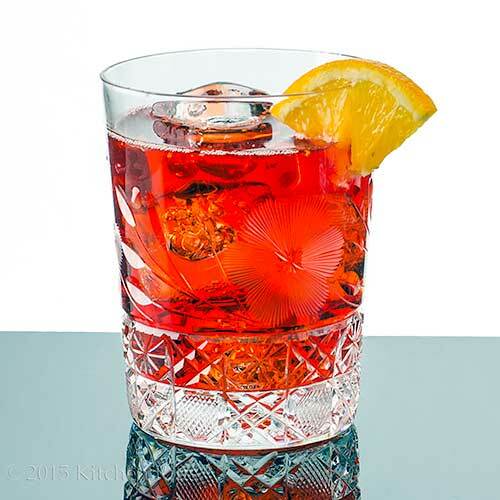 But The Negroni has a stronger flavor (because of the gin). No need to use Punt e Mes in an Americano, BTW. Today most people just use any sweet vermouth that’s available to them (more in the Notes). This recipe takes about 5 minutes to prepare, and serves one. Fill a rocks (Old-Fashioned) glass with ice. Add the Campari and sweet vermouth. Add drinking straws and stir briefly. Pour the fizzy water on top and briefly stir again with the straws. Garnish, if you wish, and serve. We like to make this drink in a rocks glass, but you could also use a tall glass if you prefer. Although our recipe calls for equal quantities of Campari and sweet vermouth, you may see versions that specify more of one ingredient than another. Feel free to experiment with this if you like. The amount of fizzy water to add is definitely up to you. Depending on our mood, we generally add about 1 to 1½ ounces. 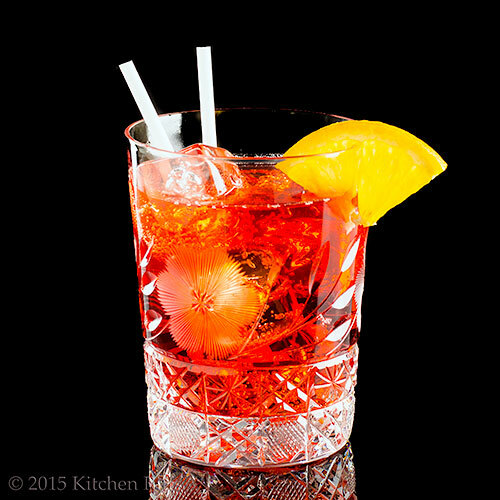 This yields a refreshing drink, but doesn’t dilute the flavor of the Campari and sweet vermouth too much. You may prefer more or less than we suggest—so definitely experiment. If you make this drink in a tall glass, you’ll probably end up adding more sparkling water. In that case, you might want to increase the Campari and sweet vermouth to 1½ ounces each (so the extra fizzy water doesn’t over-dilute the drink). Campari is a red-hued Italian liqueur with a bitter flavor. Some people enjoy it over ice or with soda water (no vermouth) as a before-dinner drink. As noted above, it’s also great in a Negroni. Like Campari, vermouth can also be consumed straight as an apéritif. Sweet (red) vermouth is also sometimes called Italian vermouth—which makes sense, because sweet vermouth was invented in Turin (by Antonio Benedetto Carpano in 1786). We like the Martini & Rossi brand of sweet vermouth in this drink, but any name-brand red vermouth will work. Our usual reminder: We’re noncommercial and don’t receive compensation for mentioning brands. We recommend only what we like and buy with our own money. BTW, vermouth has a relatively low alcohol quotient. So once it’s opened, it will start to oxidize. We store opened bottles in the refrigerator to retard the oxidization process. Punt e Mes means “point and a half” in Piedmontese. The reference is to its flavor characteristics: 1 point of sweetness, half a point of bitterness. It was invented by the Carpano firm around 1867. The flavor of Punt e Mes is stronger than that of “generic” sweet vermouth (think of it as sweet vermouth with more bitters added). Most people in the US substitute sweet vermouth in The Americano because Punt e Mes can be hard to find in US liquor stores. But if you manage to locate Punt e Mes, definitely try it in this drink and see what you think. As noted above, this cocktail was originally called the Milano-Torino. It was probably invented in a Turin bar during the 1860s (probably after 1867, when Punt e Mes came along). No one really knows who created the drink, although some think it originated in a bar run by Gaspare Campari (who may have created the drink himself). As you might have guessed, Gaspare Campari also created Campari liqueur (in 1860). During the late 1890s and early 1900s, American tourists began flocking to Italy. Legend has it that they particularly enjoyed this cocktail, which was renamed “The Americano” in their honor. Some people insist that the name of this drink actually derives from the Italian word amaro, which means bitter. Could be—but most cocktail authorities don’t buy this theory. “Well, we have to take the bitter with the sweet,” I said. “You bet your sweet life,” said Mrs K R.
“This drink is good to the bitter end,” I said, draining my glass. “Could I sweet-talk you into making me another one?” said Mrs K R.
No bitterness here! We have a bottle of Campari that we need to make a dent in. And here I thought an Americano was just a coffee drink! 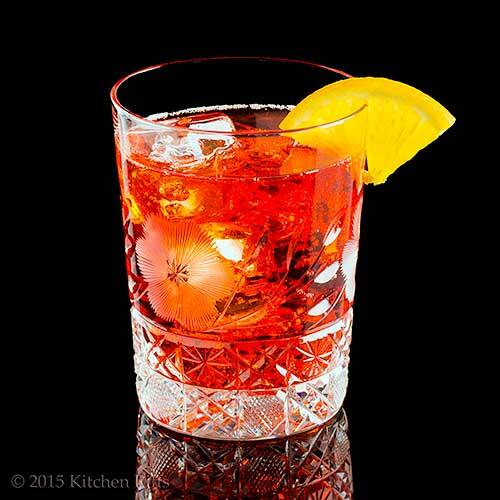 Hi Evelyne, if you like a Negroni you'll definitely like this! And this will be refreshing after your bath. :-) Thanks for the comment. Hi Abbe, I like the coffee Americano, but this is better. :-) Thanks for the comment. That is beautiful....as all your photos are :) I love your little history lessons! Your cocktail posts are my favorite. You take time to research origins and give us a lot of history about the drinks! Thank YOU for that! Love this one as I don't have to stop at just one! Hi Pat, thanks so much for that very kind comment! Hi Ansh, cocktail history and lore is so interesting, isn't it? It's what really got us into cocktails -- we used to be strictly wine and beer drinkers for decades! Thanks for the comment. Wow, what a beautiful looking cocktail! I love the vivid red color showing through crystal. Love the story behind, too. This is so pretty, you are an unending source of fun and delicious cocktails John. I can tell you have fun taste-testing them and researching the history! Hi Holly, isn't this pretty? Tasty, too. :-) Thanks for the comment. Hi Chris, we do have fun taste-testing them. And loads of fun researching them, too! Thanks for the comment. Hi Tricia, we need people to help taste test! :-) Thanks for the comment. Hi John, another delightful drink, I always share your post with my husband and we both did not realize an Americano was a drink, I guess I've been to Starbucks too many times. Take care! I love the color of this cocktail. I've been on a low-carb diet recently so I've given up alcohol for awhile- but I'm tempted with this cocktail! Hi Ray, this drink has a fun history, doesn't it? And it tastes awfully good! Thanks for the comment. Hi Rachel, Mrs K R does enjoy a second one now and again (OK, usually! ), doesn't she? :-) Thanks for the comment. Hi Cheri, I'll bet most people in the US think of an Americano as a coffee drink! It's that too, of course, but also a really tasty cocktail. Thanks for the comment. Hi Nagi, we virtually never drank cocktails until we started getting interested in their histories. We're still mainly wine drinkers, but really do enjoy cocktails -- they're so good, and look so pretty! Thanks for the comment. Hi Fran, good thing about most cocktails is the booze is low in carbs. It's the mixers that you have to worry about. ;-) Thanks for the comment. Glad I came across your site today. The cocktail does look inviting on these hot summer days. Enjoyed the bit of history too. I'll have to give this a try soon. Ha! What an interesting story behind this drink! Us Americans always take things from other countries and claim them as our own! Bless you for this and your wonderful blog which I just came across two days ago. I had just poured myself my first Campari cocktail in months; this one was of Campari, sparking water, bitters and fresh lemon. This prompted me to start reminiscing about Americanos and Negronis which I have always loved due to a very long affair with Campari. I thought to myself, "I wonder if there's a profile of one or both of these classic cocktails on kitchenriffs". Imagine my surprise and delight to find that they are the subject of your post on this very day!! Thanks for all of your fun reads! Hi Surprised, welcome! Isn't this a nice looking drink? Very refreshing! Thanks for the comment. Hi GiGi, isn't the history of this drink fun? As is its flavor! Thanks for the comment. Hi Q, I share your enthusiasm for Campari! And happy you enjoyed the post. Thanks for the comment. What an interesting insight about this cocktail... really ideal for these hot summer. Cheers! Campari? Not familiar with it at all. A little bitter? I think I can handle that. I love a little chilled vermouth with lemon or orange for an aperitif, so fancying it up with a little campari sounds like fun. A very pretty drink. Hi Denise, this really is a great warm weather drink. Or a cold weather one, for that matter. ;-) Thanks for the comment. Hi MJ, Campari has a really distinctive flavor -- one that people either like or don't. Campari and vermouth is nice a nice combo! Thanks for the comment. This came just in time because we are experiencing the hot sticky humid weather right now! Not that I mind it, as long as I have a drink like this to cool me down! Hi Ashley, this is indeed perfect timing! :-) Thanks for the comment. Hi Rocquie, Campari has a really interesting flavor! Definitely worth a try. Thanks for the comment. Hi Laura, we like easy drinks too! Sometimes you just want something fast, as you suggest. :-) Thanks for the comment. This drink sounds so tasty and a perfect one for the hot summer days.. I love the taste of Campari, so I may like this drink for sure. I enjoy the info you give on a drink, such great research. Never knew there was so much information on a cocktail or a mixed drink. Learn something new everyday..Thanks for sharing and also love hearing from Mrs. K Riffs. Enjoy your day! Good to the bitter end for sure! It's gorgeous and my kind of drink! I'm off to Campari! Hi Dottie, cocktail research -- both learning the history, and sampling the drinks -- is so rewarding. :-) I love Campari too, and this drink really showcases its flavor. Thanks for the comment. Hi Pam, definitely good to the bitter end. :-) Thanks for the comment. I've never had this cocktail... it looks and sounds amazing. Hi Pam, this is a good one to get to know -- great taste, and quite refreshing! Thanks for the comment. Another drink you have me putting on my list! And since I'm an All-American with an Italian heritage, this really seems to fit the bill! I like low-alcohol cocktails. You can still imbibe -- but not feel the effects so much that you can't drive home safely. Plus, this one is so pretty that having even just one is a celebration in itself. Hi Rosemary, with your heritage, this drink absolutely is for you! Thanks for the comment. Hi Carolyn, this drink is rather a celebration in a glass, isn't it? :-) Thanks for the comment. The only Americano I know is the cafe Americano. This drink sounds good. Hi Peachy, the coffee drink is good too, although obviously rather different. :-) Thanks for the comment. Hi Daniela, LOL -- love your description of this! Thanks for the comment. The Americano is indeed a good looking drink - that color is mesmerizing! Your cocktails are the best! I love the combination of Campari and Vermouth! Looks really refreshing! Hi Shashi, isn't that color great? So pretty! Thanks for the comment. Hi Marcela, Campari and vermouth are a wonderful duo. ;-) Thanks for the comment. Hi Charlie, I thought you'd like that Kiwis bride comment! :-) And this is a super looking drink, isn't it? Thanks for the comment. This drinks sounds delicious and your photos of it are really great! Hi Amy, it really is a great drink. Thanks so much for that kind comment! This sounds incredible! I love anything with campari in it! Hi Kristen, Campari has such an interesting flavor, doesn't it? As does this drink! Thanks for the comment. I sooooo wanna rob all your old-fashioned, vintage, glamorous glasses! Can I have the address of your home, please? Did I tell you that I'm hatching a full-proof plan to steal all your glasses? Hi Nusrat, thanks for the warning -- I'll hide the glasses! Those are cool, aren't they. They come from my great grandmother. Love their design! And what I can put in them. :-) Thanks for the comment. A beautiful drink with a fascinating history! Thanks for sharing its past. Hi Beth, isn't this nice? And cocktail histories are so interesting, aren't they? Thanks for the comment. Hi Greg, I've also heard that during Prohibition people would get doctor's prescriptions for booze. Taken straight, Campari even seems a touch medicinal. ;-) Love your post on this drink! Thanks for the comment. It is week two of Family Being Sick and seeing as I can't run away a cocktail may just be the answer... who cares that it is 8.24am on a Tuesday? Hi Hungry Mum, family sick? Bummer! You need one of these. For medicinal purposes, of course. :-) Thanks for the comment. Another beautiful cocktail. It is always fun to see the drinks you are posting. I love the pictures. Hi Dawn, it's fun writing about cocktails! They so interesting and pretty. Not to mention tasty. :-) Thanks for the comment.